Advance purchase tickets will be on sale from Monday, 19 November 2018 until Monday, 18 February 2019. At the museum ticket office, advance ticket will be available from Tuesday, 20 November 2018 until Sunday, 20 January 2019. Full admission fees apply from Tuesday, 19 February 2019. 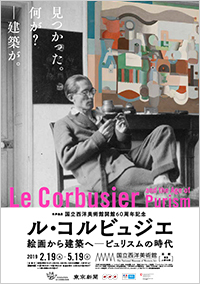 During the exhibition ‘Le Corbusier and the Age of Purism’, the Permanent Collection display will be held only in the New Wing. Please be aware that a ticket for this exhibition is required to view the Main Building galleries designed as a World Heritage Site. There are the gallery explanatory panels only in Japanese. Please use this QR code to download the exhibition’s special app. This will allow you to read the English, Chinese and Korean versions of the gallery explanatory panels on your mobile device. The Main Building of the National Museum of Western Art, Tokyo was designed by Le Corbusier (1887-1965), one of the 20th century’s greatest architects. 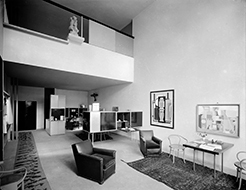 The building was inscribed on the UNESCO World Heritage List in 2016 as one of the selected works worldwide that comprise “The Architectural Work of Le Corbusier, an Outstanding Contribution to the Modern Movement.” This exhibition, commemorating the NMWA’s 60th anniversary, focuses on the period when the young Swiss-born architect Charles-Édouard Jeanneret (Le Corbusier) settled in Paris, the capital of modern art, and promoted a movement called Purism. It considers his almost decade-long work in such diverse areas as painting, architecture, urban planning, publishing and interior design. 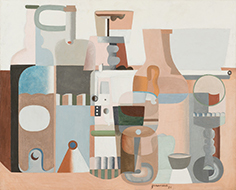 In late 1918, just after the end of World War I, Jeanneret and the painter Amédée Ozenfant began the Purism movement, which advocated an art of “construction and synthesis” that would correspond with the development of modern technology. Applying himself to painting as he also sought new forms of architecture, Jeanneret was greatly inspired in the 1920s by his interaction with the leading artists of the Parisian avant-garde, which encouraged his transformation into Le Corbusier, standard-bearer of modern architecture. 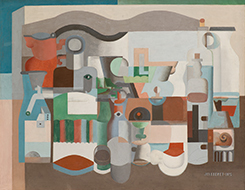 This exhibition presents approximately 100 artworks by Le Corbusier and his fellow artists, supplemented with such diverse materials as architectural models, publications and films. 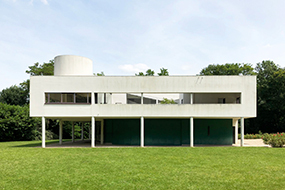 It will provide a unique opportunity to experience the spirit of the modern age that Le Corbusier sought to express, all set within a museum building of his own design.